LOVE. I seriously couldn’t believe my eyes when I found this dress on sale and in my size. So in love with the shape of it + the underwater print! This entry was posted in Outfit and tagged fish dress, water dress, zara underwater dress by Carolina Engman. Bookmark the permalink. Really like the dress, lucky you for finding it on sale ! from helen at http://www.thelovecatsinc.com // @thelovecatsinc. ps. you have one day left to enter my worldwide beauty giveaway! Really nice dress, love it! You’re so lucky to have found such a get item. I do not know why I hadnt seen this dress before! it looks amazing in you, seriously!! Wow – beautiful outfit… – you look gorgeous with your dress! Wow, your dress is so beautiful! Love it! very pretty dress! it´s perfect for you! My last outfit was also with a dress, a Two-tone one. I hope you like it! Love your Proenza Shouler bag! what a lovely lovely outfit. Love this outfit! Amazing dress! Love this dress! It fits you perfectly! LOVE THE DRESS, YOU LOOK GREAT!!! I love love love your dress. Very Beautiful! This dress is gorgeous! It gives you a kind of ethereal mermaid vibe – dig. Perfect dress!!! And it’s a perfect match with the necklace, the shoes and the bag!! Love it!! this is the most stunning dress I’ve ever seen! I love the futuristic feel of the dress. It is so cool to have the sea referenced in such a direct way, rather than just navy stripes. Of course, like I said before, I love that necklace, and it looks great with the dress. Wow!! You were soo lucky! It fit’s perfect on you!! You always look so gorgeous!!! Great style, looks so good on you! Love it! Gorgeous dress! I love the underwater print. Lovely blue shades. It’s really a very nice dress! Your dress is amazing. 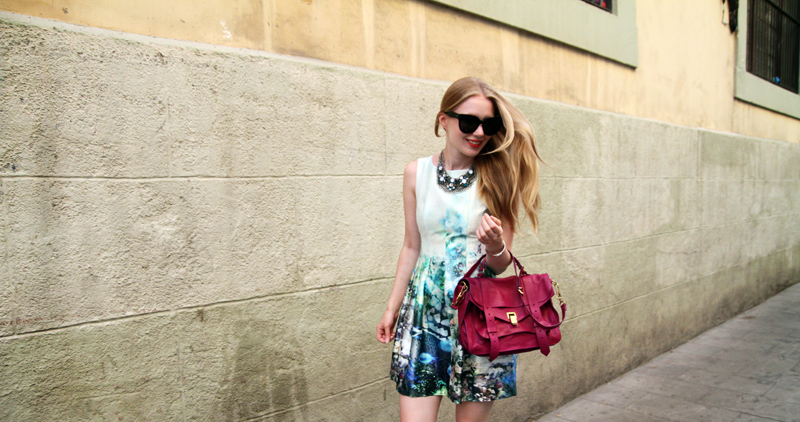 Love the print and the complimentary color with your bag is perfect. Beautiful dress! And I love how the color of the bag makes a great contrast! What a gorgeous dress! I love your necklace! So gorgeous, love the dress! Do you maybe know some “Must see”-Places in Copenhagen? wow you look so pretty in that dress! awesome dress! i love how you matched it with the aubergine handbag! I love the combination of the magenta bag and the blue print on the dress. It’s a gorgeous outfit! this is one stunning look girl. 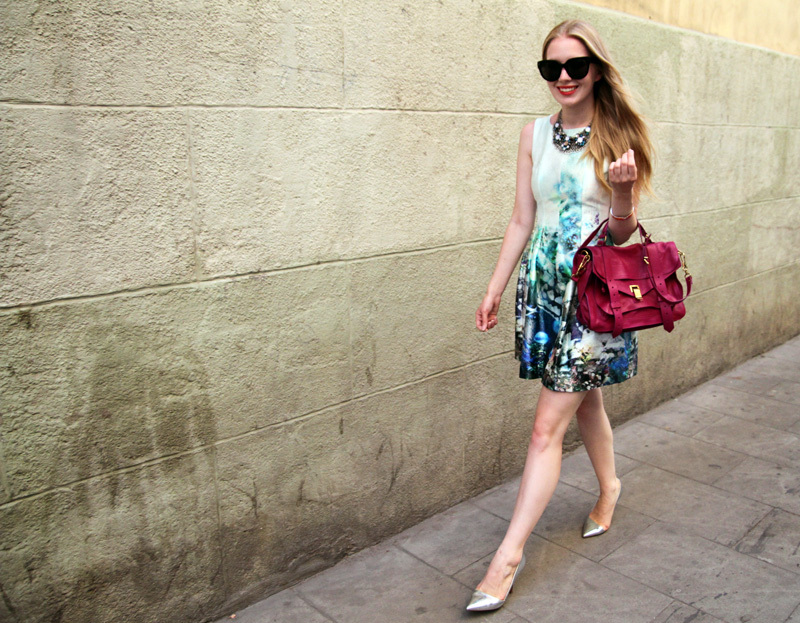 the dress is to die for and so is your proenza. totally love. lovely dress! and your smile :) its always so nice to come back to your blog, Carolina! I like your dress with the shoes and your jewelry – but for me the bag doesnt work. something more elegant would work better. Otherwise veeeery pretty! this dress is amazing! and works perfectly with the bag! Couldn’t agree more! Such a lovely print and shape! Great choice on the bag too! I also found it on sale and in my size and I was so happy! But I still don’t find ideas on how to wear it by day… Love your way though! That dress looks amazing!! So lovely. I’m in love with this dress too, it’s so beautiful! Love the way you carry it off so well. lovely! the chain necklace is my fav! I’m totally in love with this outfit!! Great find! Love that dress! That dress looks fantastic on you! The print is so dreamy. What a great dress! The print is amazing! I love this dress!! Such a great find. I haven’t even seen this one in our Zara — lucky girl!! Your style stunning!!! Very very beautiful dress and bag! You amazing beautiful! You look so fabulous dear! Amazing dress! Zara currently has amazing stuff! The dress is really pretty! You look amazing too! It’s a lovely dress, indeed! agreed! This dress is amazing! I love this dress so much!!!! I have a similar bag, but black color and smaller size. The dress and bag are beautiful. Love the rich colors. This dress is gorgeous!! Adore it!! What a lovely bag ! Your dress is amazing!And I absolutely want to have your neklace! I love, love the handbag and dress. The dress is so fun, i love the print. Stunning! Love the bag & dress!! I loved this Zara dress but couldn’t find my size in the sale back in England!! Love the dress and how you styled it. You look stunning! Love it! I bought it too in the sale the fit is soo good! Great day to night dress! Love you´re sense for wearing simple colores and pieces together so that they just look amazing and absolutely harmonizing at last! Hey! I have the same dress too – LOVE it. Check it out at http://apopofpurple.wordpress.com/2012/08/09/ss-2012-challenge-24-techno-tropics/ and let me know what you think!